In the last few years, I have had a lot of companies approach me who have a website, but they have no idea of why they aren’t getting any sales. After reviewing their site analytics, my response is usually the same. You can have the best website in the world, but if no one knows about it, you will never get any sales. Now I know that not everyone has a large budget set aside to promote their site on the internet, but I am going to talking about some of my favorite advertising mediums, some of which require a budget and some which are free. Social Mediums/Free Website Advertising – For those with or without a budget, social mediums such as Facebook, Twitter, Blogs, etc. can be a great way to promote your business. The effectiveness all depends on your industry and can be particularly good for business to consumer selling. The best part of social networking is that the only cost that is involved is your time. If you are going to set up a facebook page, it is important to keep the information updated. The same goes for blogging or twitter accounts. People are going to follow you for a reason and will expect to see fresh information as well as special offers from your business. Don’t forget about those other free online mediums. Free online classified ads, relevant forum/blog participation and free directory listings can also be great ways to drive traffic to your site. Also, if you have a store front, it’s a given to include your website address on any and all printed materials, including shopping bags, receipts or invoices, t-shirts, etc. Pay Per Click Advertising. 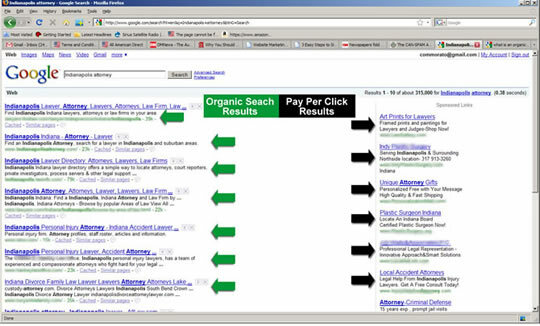 – Pay per click advertising is a great compliment to natural search engine placement. It is not recommended for business with little to no budget, because it can get very expensive, very quickly. There is a large variety of search engines that offer this type of advertising and the quality and quantity of traffic can vary greatly. From a volume standpoint, Google and Yahoo are the best places to start. They are both very easy to set up and while the average cost per clicks are typically a little more (varying by industry and keyword phrase), you are going to get the most volume of traffic. This is not to say that their traffic is necessarily going to convert the best. That is something that you will have to test to determine the best audience for what you sell. There are a lot of two and three tier advertising engines, which can cost a lot less but will generally bring in less traffic. I personally have not have a lot of success with the engines outside of the big guys (Google, Yahoo, Microsoft Ad Center, Ask.com), but that’s not to say that you won’t be able to get some good leads from the others. Start using Google Ad Words: Click Here to see an example of where your Google Ads can appear. Tip: If you are going to set up a pay per click campaign, make sure that you have a designated person to keep an eye on your accounts, minimally on a daily basis. Tweaking keyword phrases, cost per click amounts by campaign and phrase and display times can be critical in reaching your desired cost per acquisition. Display Advertising – Wanting to brand your company name? Are you promoting a special event that you want to be able to target to a certain community or demographic? If so, this is where I will recommend using a little display advertising on various websites. Websites will usually charge you based on impressions, or number of times that your display ad is shown to a web visitor. This doesn’t guarantee a click, but over time, the repetition of an ad can assist with branding efforts and/or get your promotion in front of someone at the right time. Lets say your offer carpet cleaning and are using some ads to promote a “Buy 2 rooms, get one free” promo. Maybe the web shopper sees your ad today, and whereas they don’t need their carpets cleaned at that very moment, perhaps they will two weeks from now, when they see your ad again. I recently had a customer who was needing to target 4 larger cities across the US for a 2 week promotion. We used about 25% of their online budget to display their ads on a series of local Television and Newspaper sites within those markets. Due to the nature of what they sell, the point of their marketing is to drive a phone call from the website to their inbound call center. Since we had a decent size ad displaying on those TV and newspaper sites, we were able to include a promo code for the customer to mention when they called. This is key for tracking. We had also included a phone number on some of the ads to allow the customer to either call directly from the ad or click to visit the website. When the phone is involved, tracking is never 100%, but we were able to lift our website traffic, calls and sales as a result of our overall marketing campaign. I believe it is hard for display advertising to stand on it’s own, but combined with a new other mediums, it can be effective. Tip: If your budget will allow for it, try to avoid run of site placement. This will allow the advertisers to place you anywhere within the site that they need an advertiser. This can cause your advertising to get buried on internal pages with very little traffic. Ask for fixed placement, above the fold to get the most exposure. Email Advertising – I have one bit of advice pertaining to email advertising – do it. Email advertising can be one of the most cost effective means of advertising available. Find a good email platform, follow the rules for the Can-Spam act and start collecting opt-in emails today. If you are unfamiliar with the laws in regards to email, check with a professional. The last thing that you want is for your company to be labeled as a spammer. Search Engine Optimization: Search Engine Optimization is a must with any website. Unless you are lucky enough to be selling something very unique with little online competition, you are going to need to invest some time and money in to getting your website to display “organically” in the search engines. What does it mean to be displayed organically? If your site is coming up organically, it means that your site is considered among the most relevant for a search term or phrase. You are not paying by click or by impression for this traffic. Beyond the work and investment is takes to get ranked highly in the engines, this traffic is free. Think about it. If you want to come up on page 1 for Google for the phrase “Indianapolis Pet Store”, the easiest and quickest way would be to purchase some Google pay per click advertising, as mentioned above. You are going to be paying a set price per click everytime someone clicks on your site, but you will have a solid presense. Now if your website is optimized correctly for Google, ideally you would also want to display in the organic results, as seen below. These click are free and for the percentage of web shoppers who completely ignore the paid advertising sections, you can get some great traffic. Again, paid search can be displayed almost immediately. Achieving top organic results can take some time. Experiment with both until you can find the mix that works for you. I could go on and on about all of the other advertising mediums available. There are many options, although I have found the above mentioned to be the most effective for my customers.